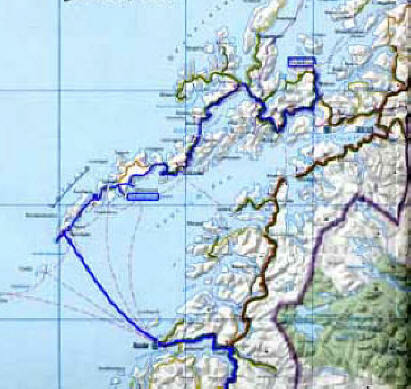 The ferry pulled passed the several harbor islands and into the Vestfjordan Sea. 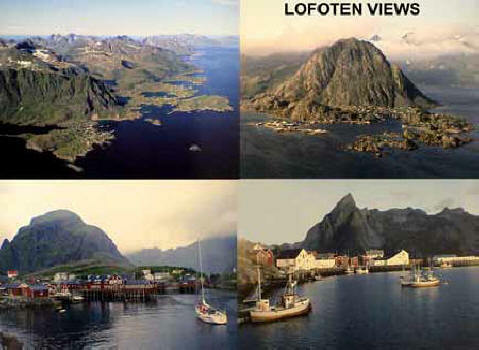 As you approach the Lofotens, its mighty mountains arise like a wall in the sea. 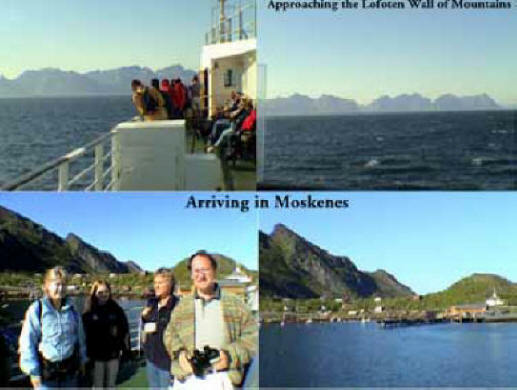 It took us 3½ hours to finally arrive at the seaport town of Moskenes on the last (most westerly) sizeable island in the Lofoten chain, which is called Moskenes Øya. 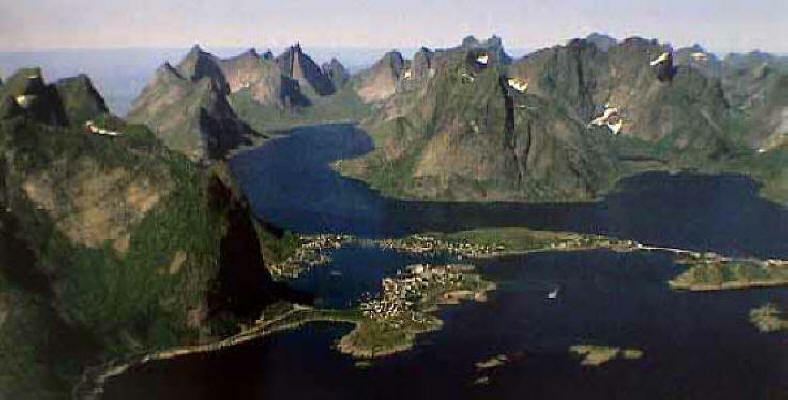 There are two barely habited smaller islands west of it called Værøy and Røst and the west-most islet-rock called Skomvær. After we retrieved our car from the ferry, we decided to follow Harald’s advice and drive the 5 miles west to the tip of the island where lies a tiny town called Å [Oooh]. 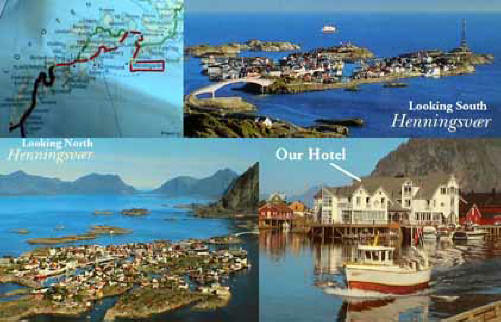 We walked with the Norlands to the tip of the island to view the exquisite scenery. There is a fishing museum there but since it was 6:30, it was closed. 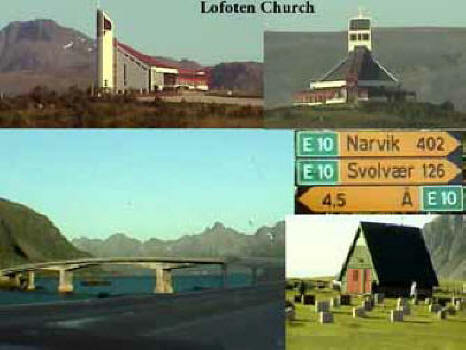 We bid our farewells to our friends and Marcia drove back on the E-10 past Moskenes and on toward our hotel in the fishing hamlet of Henningsvær. The mountains (from video, above left) were incredible and I kept video taping during the entire drive. Unfortunately, I was seeing most of it through the viewfinder (but in color). These mountains were like nothing I had ever seen before, really spectacular. 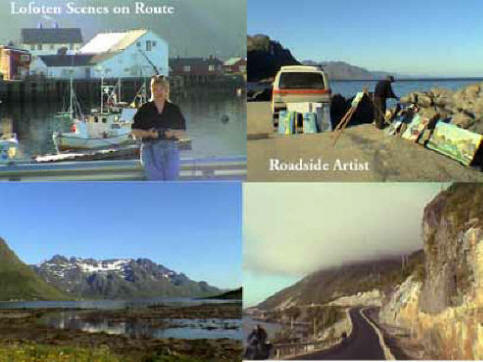 I kept hoping I would find my special mountain with the little fishing town below it from the Carmel photo, but I never did. 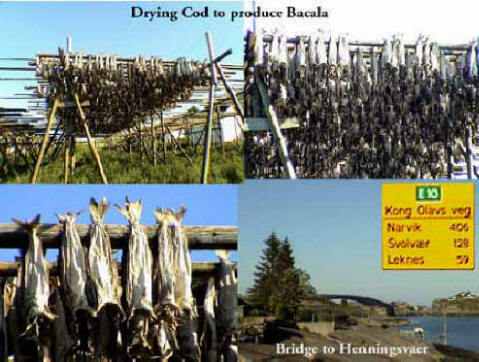 Below is a stock photo of the Lofoten chain. 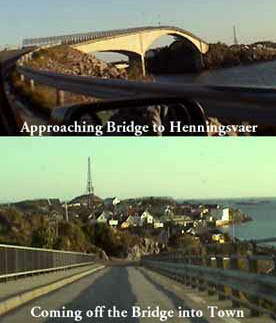 We passed the towns of Sørvågen, Reine and Ramberg, crossed several bridges, a large tunnel to change islands from Flakstadøya to Vestvågøya, past the town of Leknes then drove south to the coast and finally arrived in Henningsvær at 9 PM across a little bridge. 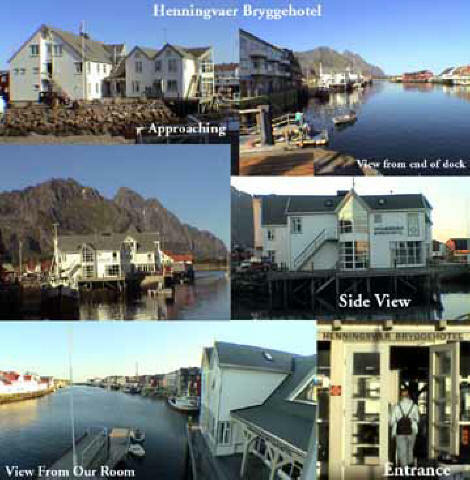 We checked into the Bryggehotell [, +47-7-607-4750] and the place was the most perfect little picturesque getaway spot you could ever imagine and our room on the second floor had a wonderful view of the harbor. I wished we could stay here several days, but we need to get to Russia by July 10th, so no delays were allowed. We had arranged ahead of time to have dinner at the hotel but the kitchen would be closing so we sat down at 9:30. After a Guinness and wine, we each had an order of smoked whale, even though I said I would never eat whale again. 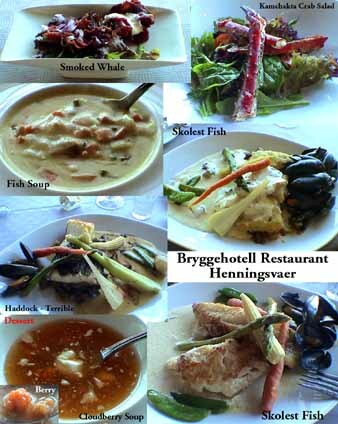 The whale was good, like what I had in Sandefjord. We had fish soup and Kamchatka crab salad. I had haddock which wasn’t good, so they gave me the Skolest fish that Marcia was eating which was much better. They gave us cloudberry soup for dessert. After we finished dinner at 11:00, we decided to take a sunny stroll outside and, what do you think, we bump into the Norlands again. Unknown to us, they had booked the same hotel. 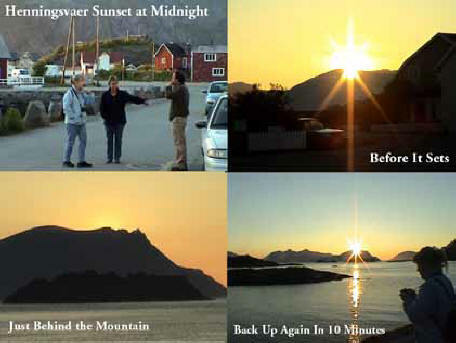 We talked and walked around waiting for the midnight sun which just tipped behind the apex of one of the mountains and then came right back up again on its way to its daylight position. 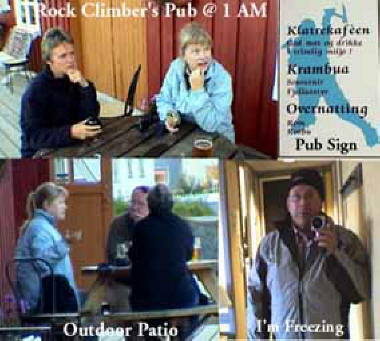 We walked into the village area and stopped for after dinner drinks with Harald and Brita at the Rock Climber’s Pub. Brita started to cry because she had just received a call that her brother was diagnosed with cancer. We were sitting outside on the benches, so I went inside to hear the live band playing but after one beer I was really feeling tired and I was freezing, so I excused myself and went to the room to work on Diario #10 and went to bed at 2:30 with the dark-out drapes keeping most of the sunlight out.